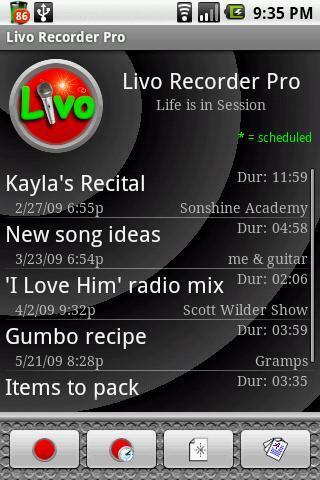 Livo Recorder Pro by Mach +1 Solutions enters the voice-recorder fray with a nice interface and some great features. To start off, you can record in the standard AMR and 3GP formats (which will maximize your record time), or you can choose to record in a high-quality WAV format. If you select WAV, you can choose your sample rate, bit rate, and channels (mono or stereo, if available on your phone). I found the audio quality between AMR and 3GP virtually indistinguishable, but you can hear the difference if you record a high-quality WAV. It's easily the best-sounding recording I've ever heard on a phone, but obviously it will eat up a lot more disk space. One of the best features that Livo Recorder Pro offers--and one that's absent from nearly every other voice recorder--is the ability to pause and resume during recording. Livo also goes one step further, allowing you to reopen something you already saved and then add on to it. This is incredibly convenient and means that you end up with fewer files. Other options include Scheduled Record, Timed Record, Stealth Mode (recording with no visible indicators), and the Tivo-style "Monitor" that allows "always-on" recording when enabled; you set the length of audio history to keep. Once you've saved the file, you have several options for sending it (all under the 'Email' button). You can send via Gmail, SMS, Bluetooth, or Evernote. I like using the Evernote option to keep synced copies elsewhere--that adds a lot of functionality, but unfortunately it will not play your files back if you recorded in the AMR format (use 3GP or WAV instead). You can also choose to have files automatically sent to an e-mail address; but if you go back and add to the files, it will result in multiple e-mail messages, which isn't ideal. Livo also offers a decent widget that allows you to record a new file and play it back without leaving your Home screen. It's handy, but occasionally buggy (sometimes you can't make it stop recording without opening the full program). It's also four cells wide, which isn't exactly tiny. One of the features I would most like to see added is the ability to choose where you want your files to be saved. This would be an easy addition and would enable you to create a folder within your Dropbox folder, which would allow you to sync your files in the cloud and on your home computer without any extra actions on your part. Overall, this is a solid little app that is easily one of the best voice recorders I have tested. The high-quality options, as well as the ability to start, stop, and add on to previously saved recordings, make it very much worth the $2 cost. It certainly still has some room for improvement, however. 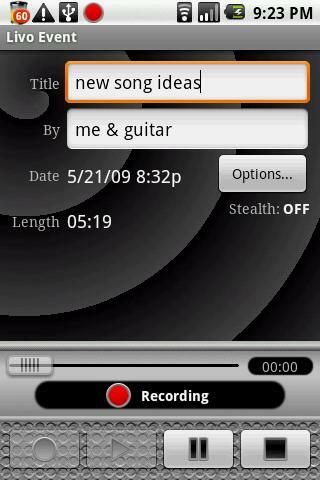 This voice recorder app provides a nice user interface and some great features.